The City of Tacoma's Environmental Services Department awards up to $50,000 a year in environmental grants to help educate residents and protect and restore our surface water resources. Apply now for a reimbursable award of up to $4,000 for a project within Tacoma city limits! Requirements: Projects should have a strong stormwater message, provide a stormwater benefit, and may be educational in nature. Projects should focus on preventing stormwater pollution and protecting or restoring clean surface water. This grant is not meant for projects focusing on water conservation or clean drinking water. Grants are open to anyone considering a project within Tacoma city limits. Produce and implement water quality education programs within the community or classroom that conserve, protect and encourage behavioral change. Become actively involved in stream or wetland restoration and protection. Generate and distribute materials and supplies for community stewardship projects that educate citizens about protecting Tacoma’s water quality and water resources. Adopt and complete projects that involve erosion control where surface waters are being affected. Install and evaluate water quality Best Management Practices (including low-impact development) included in the City’s surface water manual. Restore or protect streams and wetlands by planting vegetation, cleanups or educational field trips. Radio or TV programs or public service announcements on environmental education or restoration. Projects may be completed in the classroom, in the community or at a business. They also may be located along Tacoma’s numerous streams, such as Puget Creek and Swan Creek; along marine shorelines, including Ruston Way or Titlow Beach; or adjacent to such wetlands as Delong Pond, and Snake Lake. Please note that permits may be required. Tie-ins with the Puget Sound regional stormwater pollution prevention campaign, Puget Sound Starts Here, are encouraged. The Make a Splash program is supported by user fees from the City's surface water utility. The Make a Splash grant allowed fifty-eight 5th grade students to attend Camp Seymour at a reduced cost. Sixty-seven 5th grade students learned about water runoff from their lawns and how it affects the environment. 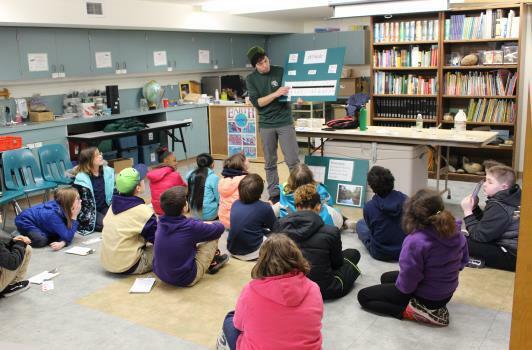 At Camp Seymour, the students attended outdoor education classes that demonstrated how waste water system affect the environment and how littering can affect water and the animals that live within an environment. This successful project allowed fifth graders to gain knowledge of how many items they and their families use can adversely affect the environment around them and what they can do to decrease the impact. As a result of receiving the Make a Splash Grant, Anthony Flaaen was able to produce 9 three minute videos about each of Tacoma’s 9 watersheds. Each one describes what area of Tacoma makes up and contributes to the watershed as well as how it empties into the Puget Sound. These productions will serve the community through education, awareness and opportunity. By visually illustrating what happens to rainwater runoff in Tacoma the viewer can read the landscape and become aware of where his or her own neighborhood is located in relation to each of these 9 watersheds. Additionally, to learning the landscape the viewer becomes aware of the potential hazards to the environment and marine life in the Puget Sound through improper spills and dumping of trash and toxic materials. The project has a positive effect on the environment. See one of his videos about the Thea Foss Waterway here. As a result of this environmental grant, the Water Sleuths program was presented to 317 5th grade students and their teachers and chaperones. The students were from 13 different classrooms from 7 different schools. The program included a one-hour outreach program and a 2-hour field trip to the Tacoma Nature Center. Field trip transportation was provided as part of the grant. The Water Sleuths program gave students a greater understanding of watersheds and their own role in protecting them. The youth that participated now practice more conservation and are better stewards of the natural environment than before the programs. The Make a Splash grant provided funding for 141 students at Bryant Middle School to visit and perform field studies at Swan Creek and Nisqually Wildlife Refuge. The grant was supported transportation and supplies. Students created block printings of salmon and other organisms found in the Swan Creek watershed. This field study gives students a much broader sense of place about Tacoma and the surrounding watersheds. The lessons were created in partnership with Christopher Towe and Pierce Conservation district. Due to the Make a Splash grant, the event Trees Over Tacoma was held. This event garnered over 100 attendees and approximately 450 trees were purchased and given out to Tacoma citizens. During this event, community members were able to hear 3 local tree experts give presentations on urban forestry with a focus on stormwater reduction and filtration. Individuals also received instructions and advice on how to plant trees. The 450 trees that were planted as a result of this event have considerable impact on the environment by reducing urban flooding and pollutants from enter our local waterways. The Make a Splash grant helped install a rain garden and trees on a private property. Based on a Pierce Conservation Group rain garden design, this project routes runoff water from the roof into two rain barrels. The excess water from these barrels drain into the rain garden. The rain garden helps prevent polluted stormwater from entering our waterways by infiltrating it through different native plants. This project also serves an education purpose. This project has signage installed, neighbors inquire about the rain garden, and has step-by-step documentation of the project on social media. Built a water catchment area to divert excess water from the alley to the rain garden. Installed two 865-gallon cisterns to catch runoff from back and front roofs with overflow connected to drain pipes feeding the rain garden. Installed approximately 179 feet of buried 3” drain pipe catching water from the above and feeding into the rain garden. Imported rain garden soil mix to fill ponding area; created berm and planted appropriate grasses, ferns, and other plants in accordance with rain garden planting zones. Installed inflow and outflow pipes in the rain garden. This project was featured on the Spring Edition of Urban Green in 2019. You can find the full episode here: cityoftacoma.org/urbangreen, episode 26.